As a follow up to last week’s post about candy corn cocktails, I wanted to share a few more ways to incorporate candy corn into your Halloween entertaining. In a 2007 feature, Yum Sugar showcases the Tick-or-tini – a cocktail in which the different spirits layer to create a candy corn martini. To achieve this look, it takes some crazy mixers and careful pouring. Infusing vodka is super popular, so The Food Network decided to infuse some with candy corn. This recipe really intrigues me. I just might start brewing a batch next weekend. Life is a Banquet has a lesson in candy corn pudding. This is totally adorable. Of course my home girl MS has a candy corn pom pom craft (right). This would be adorable hanging over a Halloween candy buffet. 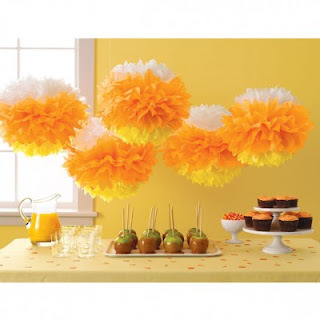 And finally, I saw this trend a few years ago and in the words of my new idol, Rachel Zoe, “I die.” The candy corn vase filler from Hostess with the Mostess.